As you will see, if you look very carefully, there are four words on this road-sign. 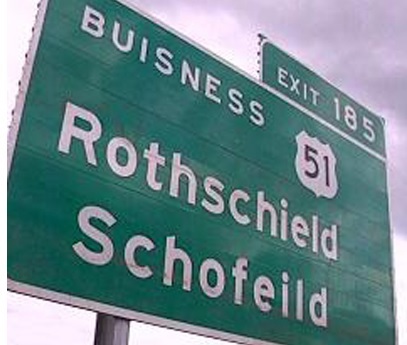 Rothschild and Schofield are suburb communities of Wausau, Wisconsin, about 140 miles north of the state capital, Madison. When it appeared, back in 2009, there was a round of buck-passing between the Director of the Bureau of Highway Operations for the Wisconsin Department of Transportation (the bigger the title, the more nugatory the man), the sign-makers and the installers. Perhaps the road-sign makers of Wisconsin should be congratulated on, at least, managing to spell the word ‘Exit’ correctly.